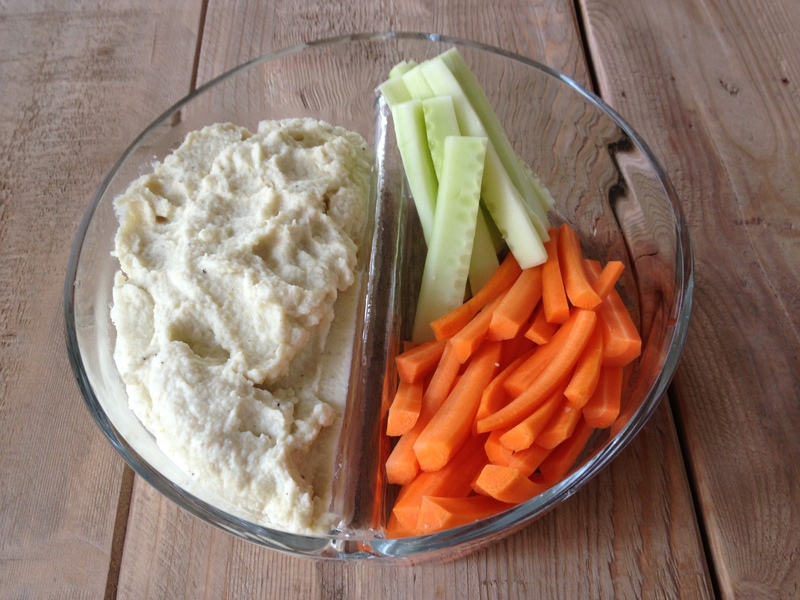 Real Super Bowl Snacks | Whole Food. Real Food. Good Food. This post was my husband’s fantastic idea :). 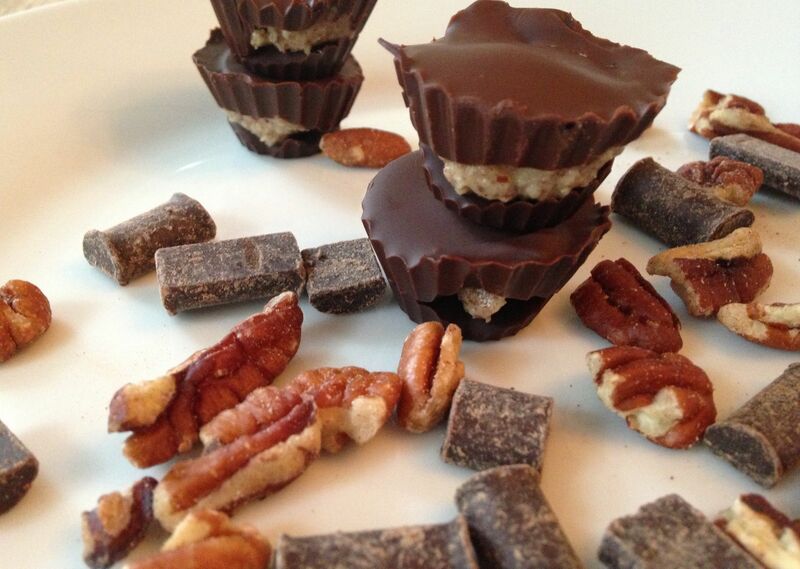 So here is a quick round-up of some real food goodies for your Super Bowl Sunday. 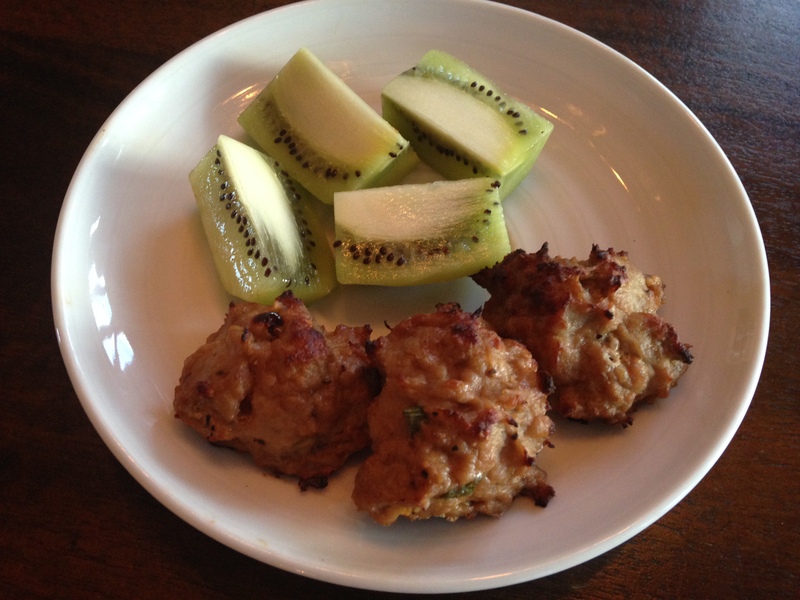 The recipe names are clickable links to the original recipe (except for the first two — asian meatballs and the nut mix). I hope everyone has a great weekend! To make the meatballs combine the following in a bowl and form into meatballs: 3 tbsp coconut aminos, 2 drops of fish sauce*, 1/4 cup chopped green onions, 1 tsp minced fresh ginger, 1 tsp minced garlic, 1/2 tsp salt (we use Himalayan pink salt), 1/2 tsp pepper and 1 pound of ground turkey (preferably organic). 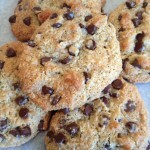 Bake at 425 °F for 25 minutes on a rimmed baking sheet. *We use Red Boat Fish Sauce, the only ingredients are anchovy and sea salt. Preheat oven to 275 degrees. Whisk together 1 egg white, 1 tbsp coconut oil, 1/4 tsp pure vanilla extract, 1 tsp ground cinnamon and 2 pinches of salt (we use Himalayan pink salt). 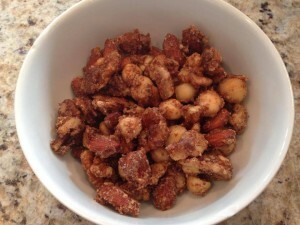 Add 1/4 cup almonds, 1/4 cup macadamia nuts, 1/2 cup walnuts and 2 tbsp almond meal. Spread evenly on a rimmed baking sheet and bake for 25 to 30 minutes until toasted. Sprinkle extra salt if desired. Melt Enjoy Life Chocolate chunks or chips in a double boiler, coat the bottom of a candy mold with the chocolate, let it set, then added a tiny scoop of pecan butter and poured chocolate over the top. 1. 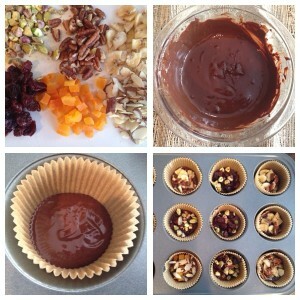 Line a mini-muffin pan with paper liners (we didn’t have mini muffin cups, so we just used a regular sized muffin tin). 2. Spoon a tablespoon of melted chocolate into each muffin liner (we use Enjoy Life Chocolate Chips). 3. Toss together nuts and fruit. Place mixture into the melted chocolate and use a spoon to make sure all of the goods are glued down into the melted chocolate. 4. 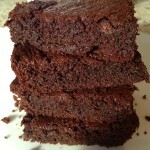 Place the muffin pan in the refrigerator until the chocolate is firm. Preheat oven to 375°F (190°C) and place wings on greased sheet pan. We use the Misto Gourmet Olive Oil Sprayer to grease the pan. I have Trader Joe’s California Estate Extra Virgin Olive Oil in my sprayer. Bake in oven for 30 minutes, or until they are cooked through. Combine hot sauce, ghee or butter, vinegar, paprika, cayenne, black pepper, garlic powder, and celery seed, in a medium saucepan. Set over low heat, mixing until butter is completely melted and combined; simmer for 5 minutes and remove from heat. 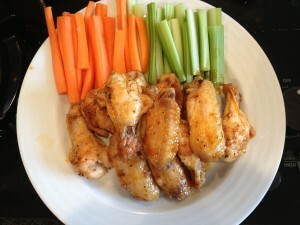 When wings are baked, dip in sauce to coat well, then shake off excess and return coated wings to baking sheet. 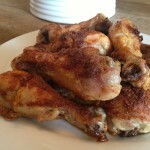 Reduce over temperature to 250°F (120°C) and give wings another 15 minutes. Toss wings in remaining sauce after you remove from over and serve. Whisk together melted butter, eggs and honey. Scoop into greased mini muffin pans, about 1 tablespoon of batter in each. 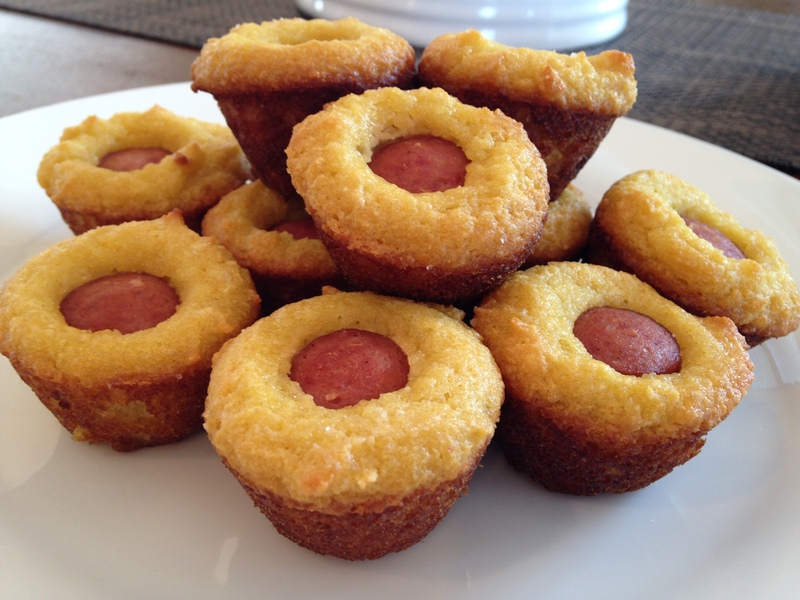 Place 1 hot dog slice in each muffin. Bake for 14-17 minutes, until golden brown. Bring about 1/2″ water to boil in a large covered pot with a steamer basket installed. Once it’s boiling, arrange florets in a single layer, stems pointed down to take the heat more directly. Add garlic. Cover and let steam until a knife can be easily inserted into the thickest stem. Lift from water and let drain and cool for a minute or two. In a food processor, collect remaining ingredients. Add cauliflower and process until smooth. Taste and adjust seasoning as needed. Chill in the refrigerator for at least one hour to allow flavors to meld. Grease a glass baking dish with coconut oil. 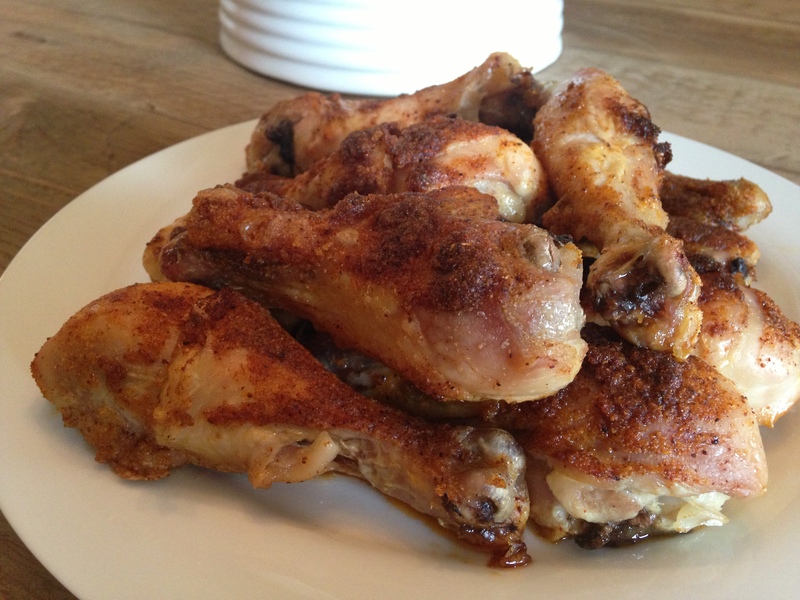 Place legs in dish and pat dry with paper towels. Coat legs with coconut oil. Season using all of the spice mix. In a small mixing bowl, combine dry ingredients. Set aside. In a medium mixing bowl, beat the eggs, honey, and vanilla extract with a hand mixer, or wire whisk. 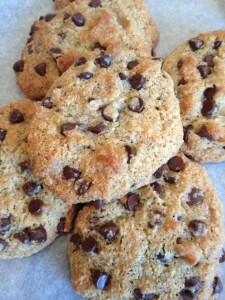 Pour wet ingredients slowly into dry ingredients and beat with mixer or fork until combined. Add the melted coconut oil and continue to blend until combined. Stir in chocolate chips. 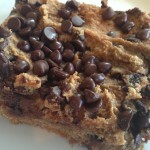 Drop Tablespoon size balls of cookie dough onto prepared baking sheet. Bake for approximately 8-10 minutes. In a medium pot, heat a tablespoon of butter over medium heat. Add the onion and sauté until cooked through. Meanwhile, in a large bowl, combine the rest of the meatball ingredients. Once the onions are cooked, add half of them to the meatball mixture (keeping the other half in the pot). Use your hands or a scoop to form the meat into balls. Place the balls onto a baking sheet and bake until cooked through — depending on the size of your meatballs, about 15-20 minutes. Meanwhile, add the sauce ingredients to the onions in the pot. Simmer the sauce while the meatballs bake in the oven. 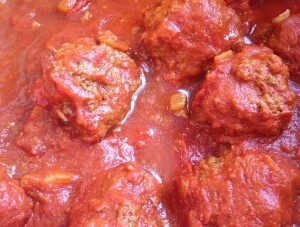 Place the meatballs int he sauce and let them get cozy and hang out for a few minutes before serving. Combine spices in a small bowl and blend. Apply rub to surface of brisket. 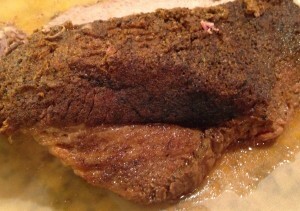 Cook brisket, uncovered, in preheated oven for 1 hour. Remove from oven and add beef broth to roasting pan. Lower oven temperature to 300 degrees F, cover roasting pan tightly with foil, and cook 3 more hours. Let brisket rest 30 minutes before slicing. Slice against the grain, place slices back in broth in a serving dish.